What a project! The new 21,000 square foot state-of-the-art Lawrence Humane Society facility is well underway. This overhead shot shows a great view of the footprint of the space. This facility incorporates high use durable construction methods and products. Structural steel framework, concrete masonry units for vertical walls and partitions are clearly seen in the photo. 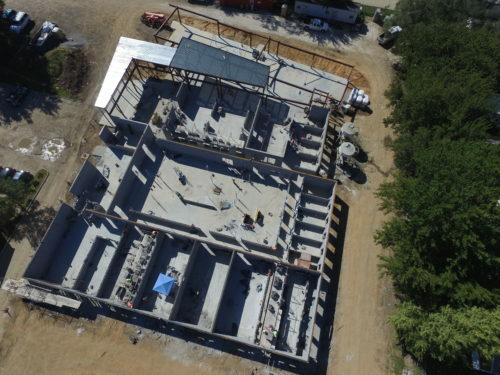 Marty Criqui, Mar Lan job superintendent, says the job presents quite a challenge making sure all the mechanical, electrical and plumbing are all carefully installed in unison with the concrete floors and masonry wall construction. Much more to come on this amazing project.